From improving muscle strength and tone, to increasing bone density and strength, to enhancing performance, strength training offers a ton of useful health benefits. This form of exercising must therefore be part of any workout schedule whether it’s designed to tone muscles, lose fat, restore mobility, or achieve any other fitness goal. When it comes to affordable resistance training equipment, the AmazonBasics Resistance Band Set is a great piece of fitness equipment. Consisting of a door anchor, carrying case, foam handles, ankle straps, and five bands, this fitness tool offers you everything you’ll ever need to carry out your resistance exercise with ease and comfort. The bands in this resistance training set come in different colors and tension levels. Color options include yellow, blue, green, black, and red, which offer resistance levels of 2 to 4, 4 to 6, 10 to 12, 15 to 20, and 25 to 30 pounds respectively. The different colors make it easy for you to easily pick out the ideal band for different workouts. You can also stack up the bands together to achieve a more vigorous workout. These handles provide a comfortable grip that helps to make workouts both safe and effective. These accessories enhance the versatility of the bands allowing you to use them in all sorts of workouts from basic ones all the way to more advanced routines. Is the AmazonBasics Resistance Band Set Worth Buying? The AmazonBasics Resistance Band Set may not be the best resistance-training tool in the market, but it’s a worthwhile buy if you’re on a budget. This set only costs a fraction of what you would normally pay for to use a resistance-training machine at the gym. However, it gives just as good of a workout. It allows comfortable training and can be used by both beginner and advanced trainers due to its versatility. You can also take or use it anywhere including the office and hotels. • The bands are made of top quality material. • You can customize workouts by varying resistance on the bands to suit your level of strength. • Bands are lightweight and small, which makes them easy to store and transport. • You’ll need a lot of space when using these bands as they’re long and cannot be shortened. • A few users have claimed that one of the bands broke after several uses in their reviews. 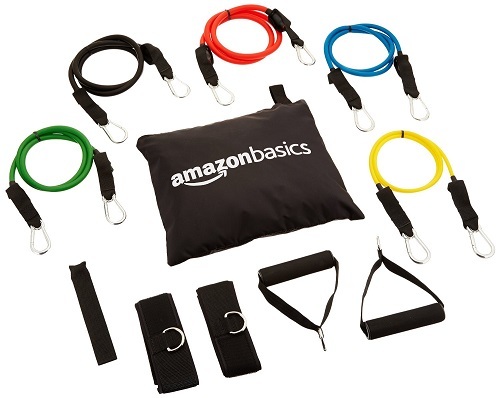 Versatile, easy to use, and effective at strength training, the AmazonBasics Resistance Band Set has many attributes that make a worthwhile purchase. It’s also compact enough to fit nicely into any home gym, and the fact that buyers get a limited 1-year warranty is one of the additional benefits that makes this resistance band set worth considering. Overall, this set offers you great value for your money when you think about the numerous workouts you can do with it for such a low asking price.